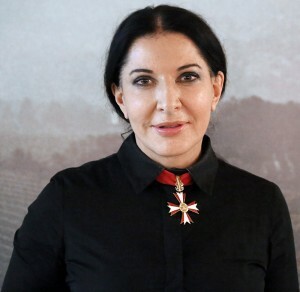 Marina Abramovic – one of the most known artists, also a performer who grips the attention of millions. This charismatic, mysterious, and dramatic personality and her creative work create a connection among the artist and the viewer, explore body and mind, provoke and fascinate for more than four decades. Serbian Marina Abramovic was born on 30 of November 1946 in Belgrade, Yugoslavia, in a family whose parents served to the communist government. She studied pictorial art in one of the Belgrade’s, and later in Zagreb’s academies, was a lecturer while at the same time she was developing the idea of her first performance. It is said, that the mother of Marina her and her brother educated by the “military regime”, they were strictly controlled, sometimes too much, but mother always supported daughter’s tendency towards art. Marina had to be at home by 10pm and this rule was used for 29 years, until she lived with her mother. Therefore, all first creative quests, experiments, traumas (cuts, burns, etc.) and other experiences had to be finished by 10pm. This artist is like a loaded gun, Russian roulette as her performances were not staged and sometimes too dangerous because no one can ensure their ending – whether or not the slippery point between the successful performance and the tragedy will be crossed. Every act of art is a ritual, and it looks like Marina is determined to sacrifice herself for it. Body serves as a subject and an object; traditional arts have sculptures, paintings, and more but Abramovic replaces them with herself, she is the main artistic expression. “The performers should hate theatre as all the props used in it, knife, blood, emotions and others, are not real. On the other side, during my performances, everything is real” says the artist. Beautiful, mysterious, it looks like she is not ageing, elegant (by the way, she collaborated with the fashion homes like Givenchy, with the magazine Vogue), this woman was once called a vampire as of her “games” with blood. During her first performance “Rhythm 10” in 1973 she studied physical and mental boundaries of a person. The artist stuck knives between the fingers of her hand and recorded into one of the cassettes she brought the sounds knives made. When she cut herself 20 times, she listened to the recording, put in the new cassette, and tried to repeat the same motions and mistakes. Marina took knives in the same order and placed them into the already existing wounds. At the end she played both cassettes and listened for the time period of one hour to the double sticking of the knives to the floor and her body. “When you start doing the performance, you can push yourself to do things you never imagined you would be able to” said the artist after her first performance. During the “Rhythm 2” in 1974 Marina tried psychoactive compounds, in other words drugs, which create catatonia, or stagnation. Even though muscles of the body had to shrink while maintaining the body in the same position for several hours, the Marina’s system reacted the other way around – she could not control herself, moved spontaneously but her mind stayed capable and clear. She also tried preparations that create schizophrenia; this artist wanted to feel and at the same time step over the point of consciousness and non-consciousness. One of the most drastic performances was “Rhythm 0” in 1974. Its goal was to explore the connection between the creator and the viewer and identify how far people can go. During this act of art, Abramovic played a passive role – she was standing still for 6 hours while people manipulated her body the way they wanted to and viewers were allowed to use 72 things placed on the table. Amongst the wide range of things there were honey, roses, grapes, perfume, bread, wine, and the life-threatening things such as scalpel, blades, scissors, even the pistol with one bullet. All participants were equal while creating this performance. Marina took all the responsibilities for possible consequences and left the freedom for the audience to interpret, act the way they wanted to. In other words, she devoted herself to the fate. “Performance developed slowly, little by little. Soft touches using rose or hands, bashful pecks on the third hour turned into the ripping of clothes using blades (…), on the fourth hour the same blades explored her live body. Throat was scratched so someone could taste the blood, some took up courage to sexually harass her (…) even the gun was pushed against the shoulders and pointed next to the head with the finger of Marina next to the trigger; tears in her eyes were seen” says Thomas McEvilley, art critic that watched this performance. Just when the staff of the gallery announced that the time is up, Abramovic finally moved and ordered for everyone to leave while not being able to look them in the eyes personally. “This was my hardest performance that I did because I was not able to control anything. The audience was in control. I learned that if we dedicate ourselves to the fate of the audience, we can die” shortly commented the performer. According to Abramovic, the best way to save performance is to repeat it from the beginning but not to record it. Even though she was married to Nesha Paripovic in 1971-1976, the most important man in her life is artist from Germany Frank Uwe Laysiepen, known as Ulay, whom she met in 1975. After one year from the beginning of this friendship, Marina moved out of her parents home for the first time and settled in with Ulay. They were lovers and at the same time creative partners who traveled through Europe in a van, visited various places of the world. During the spiritual travels in Australia they stayed with the aborigines, or in the monasteries of Buddhists in Tibet, desserts of Sahara, Gobi, and other places. Together they had been for 12 years and when they decided to turn different ways they marked this event with a sensitive performance in 1988 called “The Lovers”. Marina and Ulay placed themselves at different ends of the Great Wall of China and walked towards one another for 3 months so when they meet in the middle of the wall they could bid farewell. Together they made a lot of performances to reveal how both of them understand the friendship of man and woman, their interactions; explored each other as deeply as it is possible to explore only itself, not being afraid to hurt one another while touching hidden or already expressed emotions. In 2010 in New York’s Museum of Modern Art Abramovic performed an act called “The Artist Is Present” during which she was sitting at a small table while other people were able to sit in front of her and just look into the eyes of the artist. Everyone’s intentions were different: some wanted to see the famous artist, others to participate in the performance, or just out of curiosity to be involved in it in order to feel something amazing. It did not matter why; the whole point was to show initiative, feel the connection. Those, who expected to be amazed were not disappointed – suddenly in front of the artist appeared her former lover Ulay, with whom she did not talked since their said goodbyes in 1988. Even for those that did not know the history of these two people, it was clear, that they are not strangers to each other. Body language expressed the emotional bond and commn experiences that were not gone after all these years. It looks like it is so hard to sit and be silent, look at someone neutrally. Marina could not hold it together, stepped over the role of the observer, stretched her hands over the table, and hold hands with Ulay. Her eyes burst with tears; they were full of unsaid words, locked in feelings. Strong and at the same time well known touching moment, that had happened or will happen to all of us at some point in our lives. Past comes back like a gloomy dream that reminds about itself and disappears again, just like the Ulay who walked out of the hall, but the feeling of this moment messes up the inside for a long time. It is hard to release but sometimes it is necessary; on the inside of the person the opposite of what we are feeling and what has to be done is constantly “boiling”. Best things in life usually make the most pain. In 2012 the documentary film The Artist Is Present was released. Marina Abramovic, giving us performances that are challenging for the capabilities of the person, in the movie answers the question that she had heard throughout her career of 40 years: why is it called art? Performance becomes life, and life is an art that reborn in different forms again and again.